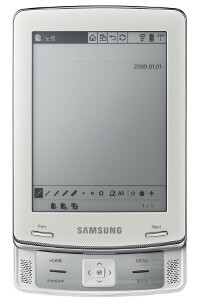 After being available in Korea for the past 5 months, the Samsung E-60 ebook reader is now coming to France. In Korea, the Samsung E-60 sells from Kyobo for 349,000 Won, which converts to about $285 USD. And now, a French website, Actualitte, is reporting that the Samsung E-60 is coming to 228 Carrefour retail stores in France for €329, which converts to about $412 USD. It also sells in the Netherlands for the same price. The price seems way to high at first glance, but compared to other ebook readers selling on Amazon France, the price is in line with the advanced features that it offers. Still though, a Kindle 2 can be had for around €210 in France after various import, shipping, and duty charges. The US version, the Samsung E-6, has been up for pre-order on JR.com for a few months now. Ironically, I sent JR an email yesterday to see if they have an ETA for the unit—haven’t heard back yet. Here’s a new video of the Samsung ebook reader that I found on YouTube yesterday. The quality isn’t great, and it’s kind of long, but it shows a lot of its features. I’d suggest jumping to the middle of the clip. There’s another video and a description of the device’s specs on our dedicated Samsung ebook readers page.